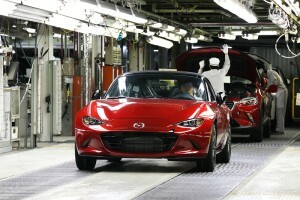 Production began Monday on the 2016 Mazda MX-5 Miatas destined for the U.S., bringing the iconic 1990s sports car hit back into the spotlight. But forget all the discussion of MSRP price points, how much fun it’s been reported to be behind the wheel and the goodies you get from pre-ordering the Launch Edition (a speaker and clothes?). What really matters is the different metals that’ll factor into the repair once it gets rear-ended, right? In this case, Mazda shows that there’s room to eliminate weight from even a tiny car. The 2016 Miata now weighs 2,332 pounds, 150 pounds less than the current model year, thanks to what it said was the use of its SKYACTIV system. Car and Driver has observed that while the first Miata only weighed 2,210 pounds, Mazda has essentially returned the car to the weight of the more apples-to-apples 1994 version which added new safety features. The SKYACTIV vehicles generally are now 60 percent high-strength steel, up 20 percentage points from their prior mild-steel configurations, according to Mazda, which didn’t specify how much aluminum the models have. The 2016 Miata body is 71 percent high-strength steel and aluminum, compared to the prior NC version’s 58 percent, Mazda spokesman Jacob Brown wrote in an email. The chassis nearly doubled its amount of high-strength steel from 12 percent to 21 percent. Here’s how the different steels broke down in the car body, including two classes of it apparently never before used. Everything but the 270-megapascal steel is considered high-strength. The different types of steels and aluminum being used — and Brown said he was only describing the body — mean you can’t fix Miatas the same way you did in the 1990s. See a great discussion of some considerations from the Society of Collision Repair Specialists Repairer Roundtable ahead of the Collision Industry Conference in Atlanta. Mazda isn’t restricting who can work on it, Brown wrote, though of course it’s partial to its own dealers. Brown said a general aluminum repair certification would suffice, and pointed out that the Miata and other Mazdas have had aluminum components since the RX-7 more than two decades ago. The rule of thumb, of course, is check with the OEM before you repair anything. As an Audi representative at the Roundtable pointed out, a generalized aluminum repair comment about heat most certainly didn’t apply for Audi. The rest of the SKYACTIV cars have actual roofs (and transverse engines), so some body details on Mazada’s website aren’t going to necessarily apply to the Miata. But some aspects seem to still apply. For example, the chassis front is “incredibly similar” because of the need to be safe in small-overlap crashes, Brown wrote. Brown said he couldn’t provide estimates of how many 2016 Miatas Mazda plans for the U.S., but reviews so far absolutely gush over the car — Road & Track, for example, called it “truly great,” and a “wake-up call” to drivers and automakers. So that could translate into more sales than the paltry amount last year; even the BMW i3 sold more units in the U.S., according to GoodCarBadCar. But regardless, we thought this one was worth a mention because of the hype, the Miata’s importance in a certain niche (No. 1 roadster of all time, according to the Los Angeles Times.) and the proof that even something half the weight of the F-150 can be lightweighted a great deal.